Marking the end of the Sea Phase of the Ex KONKAN 2018 between India and the United Kingdom, INS Kolkata and HMS Dragon sailed out during the morning hours of December 2 off Goa coast and participated in a series of exercises and drills that included asymmetric warfare with simulated attacks on ships along with a Combined Anti-Submarine Exercise (CASEX). On December 3, both ships participated in night maneuvers and air defence exercises. The following day on December 4, the ships conducted firing exercise and boarding operations with one Indian Navy team boarding HMS Dragon and two Royal Navy teams inserting INS Kolkata by slithering and by boat. The boarding operations were conducted with an aim of smooth insertion and boarding drills whilst following SOPs. Firing exercises on surface targets were also conducted on December 5 with a positive outcome. Debrief for the sea phase of KONKAN was held on the same day. KONKAN-2018 was conducted from 28 November to 06 December 2018 off Goa with units participating from both navies. The harbour phase was scheduled from 28 November to 30 November 18, followed by the sea phase. 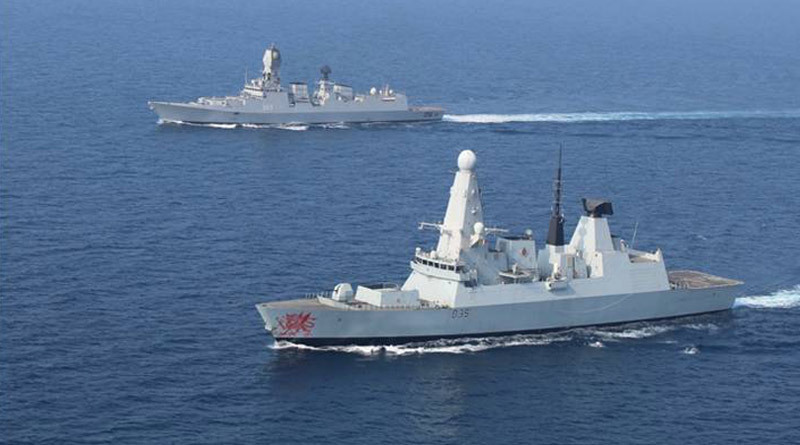 The Royal Navy was represented by HMS Dragon, a Type 45 Class Destroyer equipped with an integral Wildcat helicopter. The Indian Navy fielded the INS Kolkata, the first ship of latest Kolkata class destroyers, equipped with integral Seaking and an IN submarine. In addition, IN maritime patrol aircraft, Dornier also participated in the exercise.